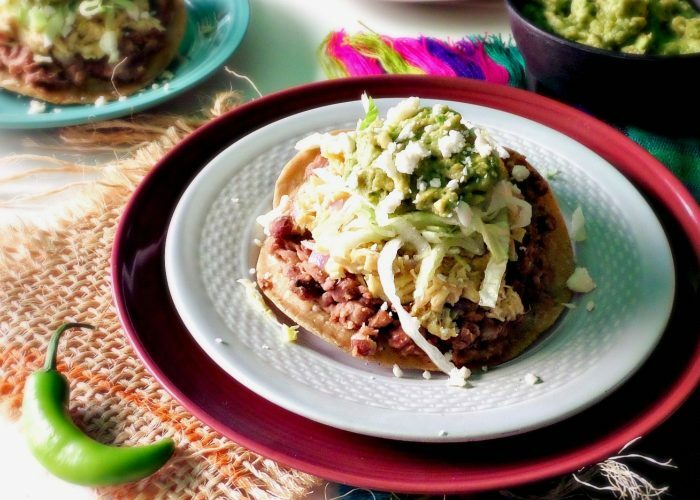 You can never have too many recipes for chicken tostadas and these crisp Mexican tostadas — piled high with refried beans, shredded chicken in a spicy salsa verde, guacamole, shredded lettuce, and crumbled queso fresco — make for a delicious meal any day of the week. 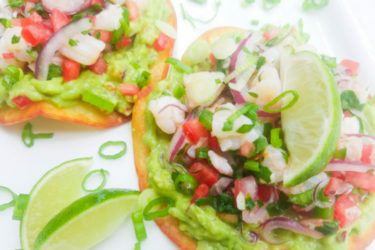 These tostadas are super easy to make, including the homemade salsa verde, and they are a great way to use up leftover rotisserie chicken. Bring the tomatillos, onion, serrano chiles, garlic and water to a boil in a medium saucepan over medium-high heat. Cover; reduce heat to low. 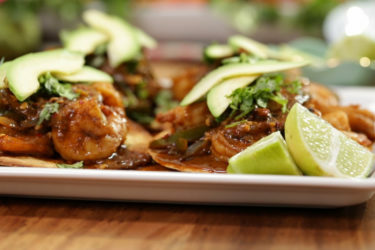 Let simmer over low heat for 8 to 10 minutes until tomatillos are cooked through. Remove from heat; let cool slightly. Puree tomatillos, onion, chiles, garlic and water in a blender until smooth; season with salt. Heat vegetable oil in a large skillet over medium-high heat. Saute onion and peppers for 2 to 3 minutes until the onion is translucent. Add the garlic and saute for 30 seconds. Stir in the shredded chicken, chicken broth, and salsa verde; season with salt and black pepper to taste. Let simmer, stirring occasionally, for 10 to 12 minutes or until heated through. While the chicken is simmering, heat the refried beans in a small saucepan over medium heat. Prepare the guacamole by mixing together the avocado, serrano chile, and Mexican crema, mashing with a fork until desired consistency; season lightly with salt. 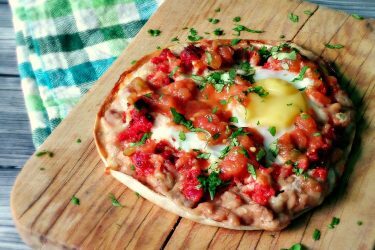 For the tostadas, spread 3 tablespoons of refried beans on a tostada shell. Top with 3 to 4 tablespoons of the salsa verde chicken, 1 to 2 tablespoons of guacamole, shredded lettuce, and 1 tablespoon of crumbled queso fresco.